Kerry Wong recently tested some cheap LM2596 DC buck converter modules, very similar to the ones I purchased off Aliexpress a over a year ago for around 80c ea. One of the comments indicated these actually use clones of the LM2576 re-labeled as 2596. 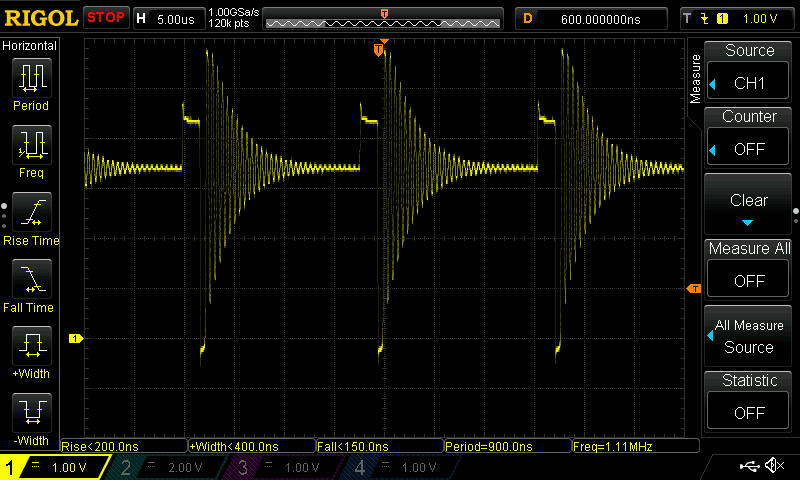 The switching frequency of the LM2576 is around 50KHz, vs 150KHz for the LM2596, making it easy to see the difference on a scope. 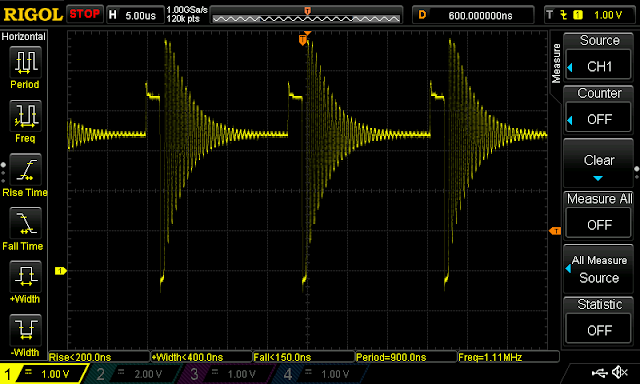 Measuring of the 5us scale, two cycles takes about 36us, or 18us per cycle, or 55.5kHz. So the ones I received are fakes. I did test the modules after I received them, and found they are good for about 2A @5V with 12V in, so they weren't a total waste of money. 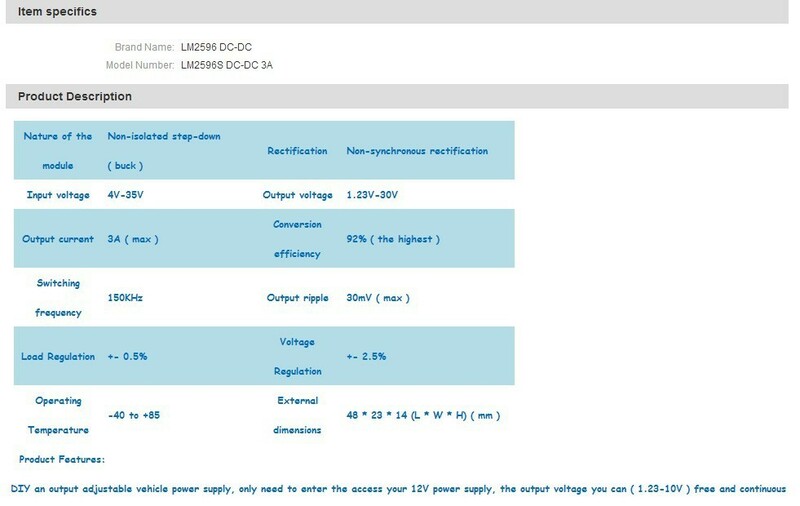 The latest "LM2596" modules I've seen online clearly do not use a real or even fake 2496. The SOIC-8 part appears to be a MPS MP1584. With a switching frequency of up to 1.5Mhz and a smaller form factor, the modules look like a reasonable value at 42c ea, even though they're falsely advertised as LM2596. Strangely, some sellers correctly advertise the same modules as MP1584 converters, but at several times the price. protip: if the cost of the ENTIRE buck converter board INCLUDING SHIPPING is LESS than the cost of an lm2596, quantity 10,000, direct from natsemi (now Texas Instruments) - chances are the part is FAKE! eventually i'll get around to decapping some of these fakes and put them under a microscope to compare them to genuine lm2596 purchased direct from TI. For parts where there is no 2nd source, I'd generally agree. However companies like OnSemi and Fairchild make some of the same parts. Also, Asia pricing is often lower than US. Mouser lists the LM2596 for 90c/qty 9600, but I suspect pricing in Asia direct from OnSemi is closer to 50c. No, I haven't tried building a buck converter from scratch.